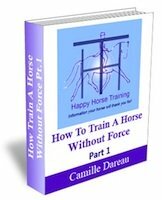 Happy Horse training is founded by sisters Camille and Gabrielle Dareau, who live in the beautiful Gascony region of the south of France. As well as the information on this site, residential teaching courses are available in this magnificent setting. See our other site Realize Riding for more details. 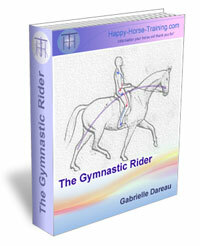 Camille Dareau is a BHSAI and a qualified Cranio-sacral therapist and has taught riding and practiced as a therapist for over ten years, also bringing her highly-tuned awareness of the body's healing process into the domain of teaching and training to give great insight into the processes involved. 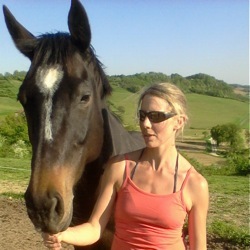 Gabrielle Dareau started studying dressage as a pupil of Daniel Pevsner, FBHS and pupil of the Spanish Riding School of Vienna, before completing a degree at Edinburgh College of Art. As well as being passionate about both the practice and philosophy of riding and teaching, she is also a skilled animal portrait artist. We both took a strong interest in dressage early in our riding careers, going on to learn as much as we could from different sources, whether from teachers, writings, observation, or our own experience. After moving from Scotland to France some years ago, we specialized in teaching on the lunge which allowed us to study in depth - and with a wide variety of different riders - the real influence of the rider's position on the horse, combining this with our own riding and training experience to come to a profound understanding of the universal principles of riding in engagement. In our passion for the art of dressage as a pure gymnastic discipline, we have taken the perhaps unusual approach of studying riding purely for its own sake with no other agenda, whether competitive, commercial or even that of simple recognition. 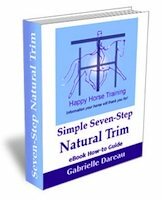 This has allowed us to work with horses that in most other circumstances would be rejected, and in doing so we have discovered exactly how it is that the rider can transform themselves in order to transform the horse. In the normal context of dressage based on the performance of certain movements, our results may be limited, but the quality of movement we achieve through progressively suppling problematic horses by means of engagement speaks for itself. Riders who apply the principles we teach, often very different from what they learned previously, are equally convinced by the results. When we come to difficulties with our horses in their training or management, we don't think of 'selling them on and getting another one' as being a relevant option. To us that would only mean passing up an opportunity to learn something from the process of finding a real solution. thanks to this attitude we have seen many of our horses develop a radically different appearance and disposition, to the point of a real change in their conformation and basic temperament, characteristics usually seen as unalterable. In the same way we have seen riders of many different types and abilities transform to become confident, effective and skillful at riding in engagement, which had often been a totally undiscovered dimension of riding to them. "My goodness what a change has taken place in my riding. I think that I'm starting to sit "into" the horse rather than on top of him. I felt my horse's movement in a way that has almost never happened before […] I could feel his gratitude - he seemed to be saying "thank goodness you finally got it!" This holiday has been more than I hoped for. The riding instruction is outstanding. If instructors in the UK taught this way there would be a lot of happy riders and horses. 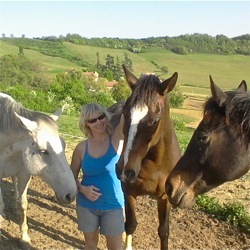 Everything has been lovely, it's a very special place which I fully intend to return to"
For more feedback on our teaching and work with horses go to Testimonials. By finding out how to master the unique phenomenon of engagement, with the right intention, understanding, and enough determination, you can discover the profound rewards of making a difficult or ordinary horse beautiful, or a good horse magnificent!